At 3000 years old, the ancient appassimento winemaking method is the epitome of tried and true. This technique of drying fully ripe grapes on mats or slated crates, for a considerable period of time before fermentation, reaches its apotheosis in the great Italian wines, Amarone and Ripasso. This method helps accentuate the sugars, energize the acids and integrate the tannins resulting in deeper coloured and fuller-flavoured wines. Amarone is produced in the region of Veneto by estates that make Valpolicella, one of the most popular wines of this area in Northeastern Italy. Amarone della Valpolicella, usually known as Amarone, is a typically rich Italian dry red wine made from the partially dried grapes of the Corvina (40.0% – 70.0%), Rondinella (20.0% – 40.0%) and Molinara (5.0% – 25.0%) varieties. The wine was awarded Denominazione di Origine Controllata (DOC) status in December 1990. On 4 December 2009, Amarone and Recioto della Valpolicella were promoted to the status of Denominazione di Origine Controllata e Garantita (DOCG). Grapes are harvested ripe in the first two weeks of October, by carefully choosing bunches having fruits not too close to each other, to let the air flow. Grapes are allowed to dry, traditionally on straw mats. This process is called appassimento or rasinate (to dry and shrivel) in Italian. This concentrates the remaining sugars and flavors and is similar to the production of French Vin de Paille. The pomace left over from pressing off the Amarone is used in the production of Ripasso Valpolicellas. Modern Amarone is now produced in special drying chambers under controlled conditions. This new approach minimizes the amount of handling that the grapes go through and help prevent the onset of Botrytis cinerea. 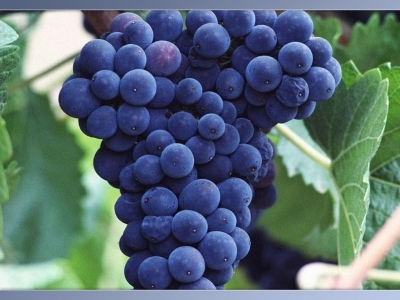 In Amarone, the quality of the grape skin is a primary concern as that component brings the tannins, color and intensity of flavor to the wine. The process of desiccation not only concentrates the juices within the grape but also increases the skin contact of the grapes. The drying process further metabolizes the acids within the grape and creates a polymerization of the tannins in the skin which contribute to the overall balance of the finished wine. The length of the drying process is typically 120 days but varies according to producer and the quality of the harvest. The most evident consequence of this process is the loss of weight: 35 to 45% for Corvina grapes, 30 to 40% for Molinara and 27 to 40% for Rondinella. Following drying, end of January/beginning of February, the grapes are crushed and go through a dry low temperature fermentation process which can last up to 30/50 days. The reduced water content can slow down the fermentation process, increasing the risk of spoilage and potential wine faults such as high volatile acidity. After fermentation, the wine is then aged in barriques made from either French, Slovenian or Slavonian oak. If fermentation is stopped early, the resulting wine will contain residual sugar (more than 4 grams of sugar per litre) and produce a sweeter wine known Recioto della Valpolicella. Unlike traditional Amarone, Recioto della Valpolicella can also be used to produce a sparkling wine. Ripasso is an Italian wine produced when the partially aged Valpolicella is contacted with the lees of the Amarone, including the unpressed grape skins. The lees still contain a lot of sugar and the Valpolicella undergoes a second fermentation. This will typically take place in the spring following the harvest. The resulting wine is more tannic, with a deeper color, more alcohol and more extract. The word Ripasso designates both the winemaking technique and the wine, and is usually found on a wine label. The final result is a very ripe, raisiny, full-bodied wine with very little acid. Alcohol content easily surpasses 15% (the legal minimum is 14%) and the resulting wine is rarely released until five years after the vintage, even though this is not a legal requirement. The labor intensive process poses significant risk for the development of various wine faults. Wet and rainy weather during harvest time can cause the grapes to rot before drying out which then requires winemakers to be diligent in removing rotted bunches or moldy flavors in the wine will be accentuated.